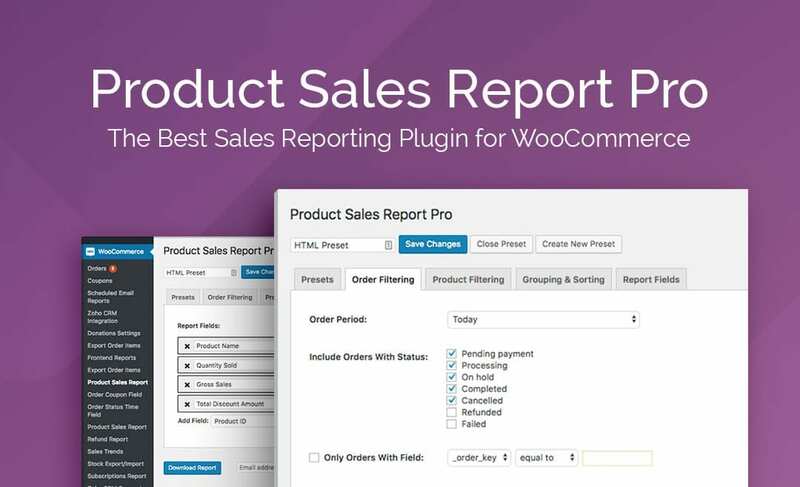 The Product Sales Report Pro plugin helps WooCommerce managers gain deep insights into the performance of their WooCommerce stores. With Product Sales Report Pro, webmasters can quickly and easily generate reports on the quantity and amount of sales of individual WooCommerce products sold over a specified date range. The exported data will offer an overview of the sales performance of individual WooCommerce products, helping brands refine their online sales strategies. Product Sales Report Pro can export data into a range of formats (XLSX, XLS, HTML, or CSV) for further analysis in compatible software. Similar to Export Items Order Pro, the Product Sales Report Pro plugin offers an overview of product sales and is designed to report on product sales totals, whereas the Export Items Order Pro plugin provides granular details relating to individual orders and customer information. Product Sales Report Pro plugin sports a simple interface that integrates seamlessly with the WordPress aesthetic. After installing and activating the plugin, Product Sales Report Pro creates its own menu item in the WordPress dashboard. Powerful and robust, Product Sales Report Pro is both quick and easy to use. The plugin is comprised of a series of tabs for the settings pages, allowing for different types of filtering, giving the user the ability to set various reporting parameters for the generated report. 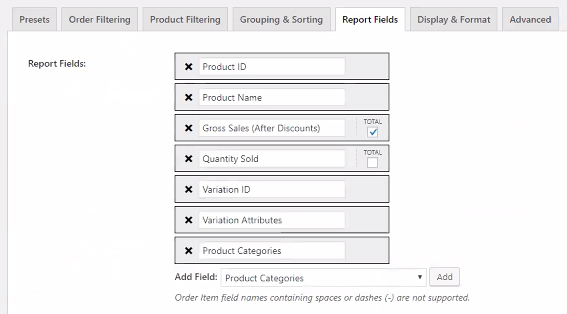 To create a report based on order related variables, use the Order Filtering tab. Here, reports can be generated either by using predefined order dates or by setting a specific order date range of custom dates. Reports can also be defined in relation to the order status, for example, a completed order, an order in processing, an order on hold and so on. 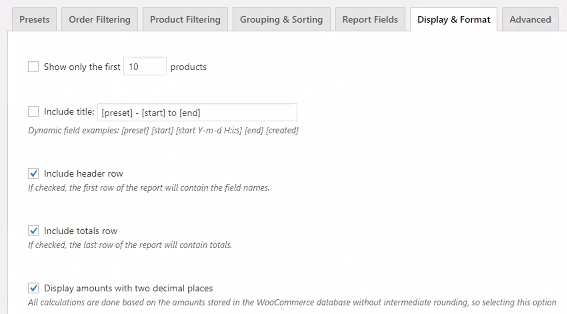 Next, reports can be filtered down in a number of ways, such as by using specific fields from the internal WooCommerce database. 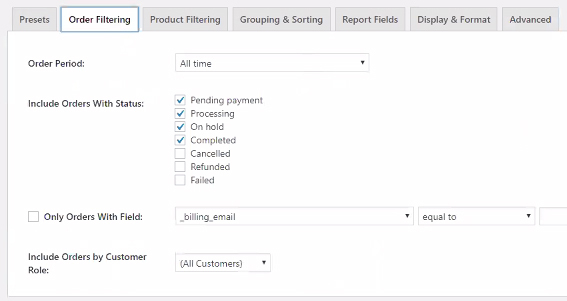 With this degree of order filtering, reports can be engineered to display data relating to only one customer email address, a specific payment method, or similar. 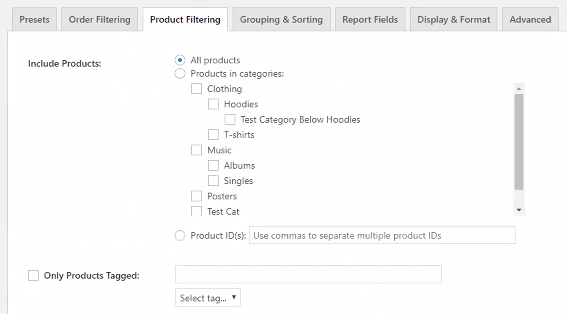 The Product Filtering settings tab allows users to create reports based on the product details themselves, setting variables such as Categories, Tags or Product IDs or fields for the reports. An incredibly handy feature for some users, the Grouping and Sorting settings tab allows the user to get more granular with the sales report data. The Sort By feature simply lets the user select the field that they’re wanting to sort the report by and the order that it’ll display in. The Group By feature allows users to segment the product sales reports by another level, bringing an additional reporting field into the mix. By default, the user will only be able to generate total values on a per product or product variation basis, however, with the Group By feature, they’re able to further segment by a variable from the orders of that product, for example, the payment method. For example, with this configuration the report will display each product listed in terms of total sales for each payment method, generating a report that can state data along the lines of “Product Name and Stripe sold x amount and Product Name and PayPal sold y amount”. The Group By feature can be set to segment reports by a number of other fields, such as billing email address, for example. Both the Group By and Sort By features allow users to generate more customized reports; however, for more extensive reporting of order-specific data in a similar fashion, it is recommended to purchase Export Order Items Pro or try the free version of that plugin. The Report Fields tab allows the user to decide which fields they would like to display on the report. There are plenty of reporting field options to select from, including a number of default, built in fields, as well as ones that can be pulled in from WooCommerce that are stored in the product or product variation. It is even possible to pull in total values from certain order item meta fields. The reporting fields can be added, renamed, deleted, rearranged and totaled up should you wish to include total data values related to specific numeric field. The Display and Format settings tab allows users to better format their report by including additional information. Here, users can choose to include a report title, include a header row, include a totals row and decide whether certain numeric values will be rounded off to two decimal points. Users can also decide which format the report will be exported into: XLSX, XLS, HTML, HTML Enhanced, or CSV. 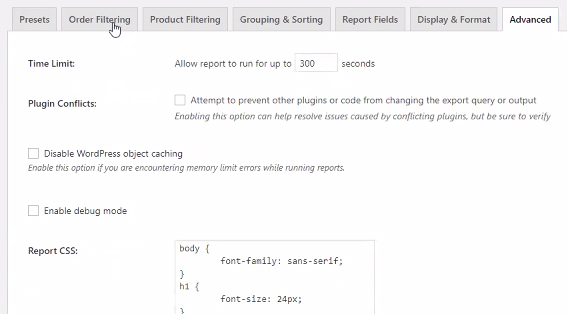 The Advanced settings tab includes a number of features for advanced use cases such as setting a server time limit for report generation, putting the plugin into debugging mode, adding CSS for styling the HTML report, and more. Finally, the Presets settings tab lets users create presets for their report parameters. Presets let users save the reports’ settings so that they don’t have to be set up each time. Here the user can simply return to the preset each time and quickly create a report. Please note:The screenshots are from version 2.1.7 of Product Sales Report Pro for WooCommerce. For the latest feature list update of version 1.0.1 please refer to this blog post..